National Popcorn Day (January 19) can be everyday with Vic’s Corn Popper and Stretching the One Income Dollar. Popcorn is a great and inexpensive snack that can offer healthful options compared to other snack foods. 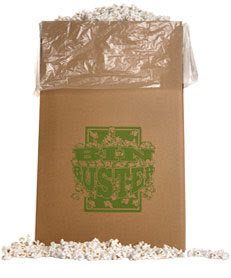 For the best value, nothing compares to our Gourmet White Bin Buster where you can purchase 4 lbs. of fresh, tender and sweet popcorn for less than 60 cents per one-ounce serving. “Lite” and half-salt versions also are low fat, low calorie options, while providing whole grains, fiber and antioxidants. All of Vic’s popcorn is prepared fresh and shipped within 24 hours of receiving the order. All online Vic’s orders receive free, standard shipping anywhere in the U.S. Vic’s also can accommodate specific delivery dates for customer birthdays, weddings and other special occasions. Vic’s offers you wide range of flavors to fit any taste, including Ranch, Yellow Cheddar Cheese, Caramel Peanut, Caramel Chocolate Swirl, and White Cheddar Cheese. In addition to the Gourmet White and Caramel Chocolate Swirl, our customer favorites include Vic’s Mix (Caramel, cheese and gourmet white flavors mixed together). Gerry and I have tried these and personally love them! But you'll really have to try hard to use the self control when eating!! Yummy!